Oakland SWAT Sgt. 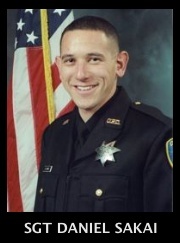 Daniel Sakai, 35, was killed in the line of duty on March 21, 2009, along with fellow officers Sgt. Ervin Romans, Sgt. Mark Dunakin and Officer John Hege. Daniel is survived by his wife, Jenni; and daughter, Jojiye.